I love apple cider around the holidays. Last year, Heather made a caramel apple cider for our Christmas party, and it has changed my life!!! Holy cow! MmM!!! I can't even begin to tell you how amazing it is! So I won't. I will just give you the recipe. Try it. Love it! *Pour the apple cider into a large stockpot on the stove. Set heat to medium-high. Add orange juice, cinnamon sticks, and allspice. *Thoroughly wash your orange and then gently stab the whole cloves into it. If you find it hard to do that without destroying the cloves, use a toothpick to poke little holes first and then insert the cloves. *Gently drop the whole orange into the pot. Bring the cider to a boil and then reduce heat to a low simmer. Simmer on low for 60 minutes or longer if you wish. If at any time the orange splits open, remove it from the pot. *After the cider has simmered for an hour, add caramel sauce and stir to combine and dissolve. Add more caramel to taste if needed. 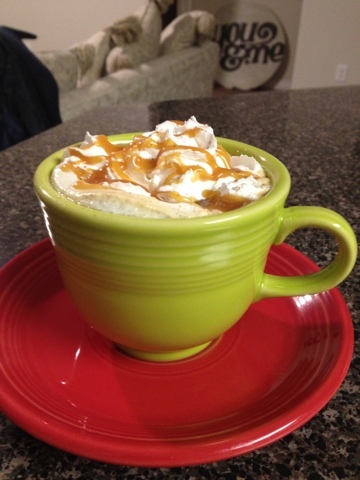 * When ready to serve, ladle the cider into mugs, top with whipped cream, and give it a drizzle of caramel and a sprinkle of cinnamon. Hope you enjoy it!! I am positive you will! !